Dog-friendly Garland Ranch Regional Park in Carmel Valley is a popular spot for leisure hiking. Breathtaking views lie around every corner of this 4,462-acre park, with trails varying from easy to strenuous. Notable features at Garland Ranch Regional Park include the Carmel River, Garzas Creek, a redwood canyon and a charming waterfall. Historic buildings dot Garland Ranch Regional Park, allowing visitors to experience Carmel Valley as it once was. Garland Ranch Regional Park is Carmel Valley&apos;s central spot for hiking. 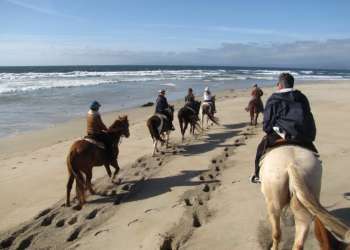 It is also a popular location for horseback riding and birding, and one of the region&apos;s top geocacheing sites. Mountain biking is permitted on the Cooper Ranch Loop only; horseback riding is allowed on most other trails. Stop at the Garland Ranch Regional Park Visitors Center for hiking trail maps and information on park activities. The park rangers at Garland Ranch Regional Park are great resources, and can answer almost any question. Garland Ranch Regional Park has many off-leash areas for dogs to roam and is a popular Monterey dog-friendly hiking area. Dogs must be under voice command at Garland Ranch Regional Park, and owners must maintain visual contact with their dogs at all times. Many hiking trails at Garland Ranch Regional Park have specially designed water fountains, so hikers and their four-legged friends may both rehydrate. There&apos;s a trail at Garland Ranch Regional Park for every level of hiker, with nearly flat paths for the novice to steep inclines for the dedicated hiker. Easy trails include the Buckeye Nature Trail, which has many informative signs explaining the natural features of the park. 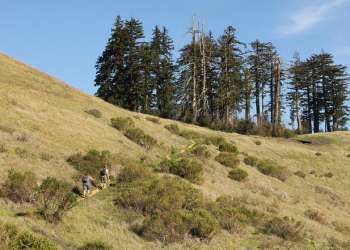 The most difficult trails may be the East Ridge Trail or the Snivley&apos;s Ridge Trail, both of which have steep climbs with views of Carmel Valley and the Ventana Wilderness. Hiking trails wander alongside Garzas Creek, through Rumsien Indian habitation sites and nineteenth-century homesteading and logging settlements, along the Carmel River, and up the Santa Lucia Mountains. Download a PDF of the Garland Ranch Regional Park trail map from the Monterey Peninsula Regional Park District website. See item five on our list of Top Ten Day Hikes in Monterey County for details on a hike up the Waterfall and Snively&apos;s Ridge trails. Read more on the blog "Tales from the Trail: Garland Ranch Regional Park." From Highway 1, head east on Carmel Valley Road for 8.6 miles. Garland Ranch Regional Park&apos;s main entrance will be on your right. From Highway 101, take Route 68 east to Laureles Grade. Take Laureles Grade to Carmel Valley Road and turn right. Garland Ranch Regional Park&apos;s main entrance will be on your left.